The Client Portal feature in Janitorial Manager empowers a cleaning company’s clients so that they are constantly aware of what’s happening in their buildings. Clients can submit work orders and let the cleaning company know if additional work is needed. 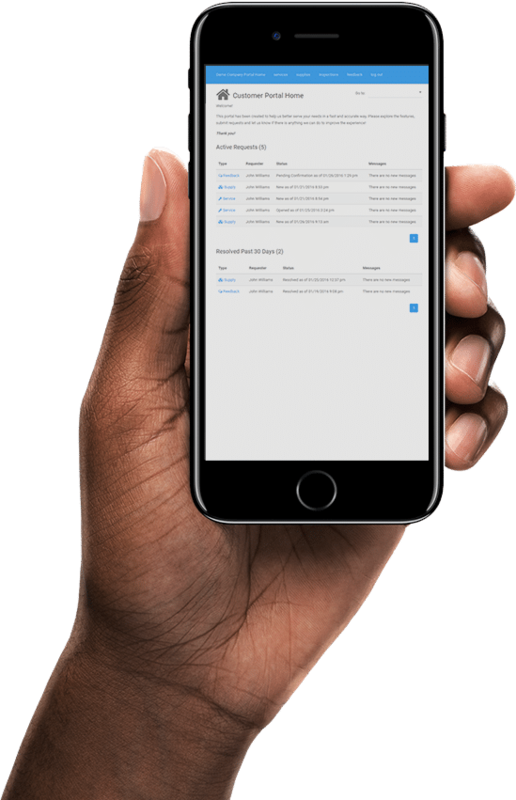 Give Your Clients Access to JM From Any Phone At Any Time. The Ability to Communicate Seamlessly With Cleaning Staff – In Live Time! The Client Portal feature of Janitorial Manager enables your clients to oversee multiple cleaning locations that your teams clean for them. This gives your clients the power to make sure each location meets their cleaning standards. Members of the cleaning team can also communicate with the client about specific issues so there’s less confusion! We believe that clients shouldn’t hesitate to communicate directly with their cleaning team. In the Client Portal, clients can submit supply requests, complaints, custom service requests (work orders), constructive feedback for your cleaning staff, inspection requests, or even quick thank you’s for a great job. At Janitorial Manager, we are firm believers that communication is the key to client retention, returning business, and referrals. We built our Client Portal to help aid in the communication between your cleaning team and your clients. This allows you to be more responsive to your client in real-time, making them feel as if they are the only client you have. With the Client Portal feature, clients are able to submit work orders in real time to add requests. Clients can also track the progress for each submitted request. Receiving and completing requests has never been easier than with the Client Portal in Janitorial Manager! No more false and unreliable information sent to your phone! Janitorial Manager keeps you updated on the status of each location. We support you in making sure that your staff is cleaning the locations correctly the first time. Management also always knows where employees are and for how long, ensuring employees are honest about their whereabouts and keeping clients and customers happy! At Janitorial Manager, we know client retention is a major industry issue. This is yet another reason behind the Client Portal. We believe that the key to client retention in the janitorial industry is better communication with your clients. Being able to notify customers about their submitted work orders, chat with them about issues they’re having, and receive feedback about your services helps each customer to feel important and valued by your business. Customized inspections can be filled out in the field and saved to your client’s file. Administrators can make sure that inspections meet your company’s standards. Create, track, and manage work orders. You can filter orders by quoted, scheduled, and completed. This helps you to better manage a job’s ROI. Tracking allows administrators to monitor employee performance and attendance. You can also take a detailed look at employee performance over the year.